I don't for one second condone investing in cluster bomb or weapons of mass destruction makers via KiwiSaver funds, but I do think some people are over-reacting to what the media is calling KiwiSaver's dirty little secret. Let's be perfectly clear, KiwiSaver managers are not deliberately investing in "unethical" investments. Rather they are gaining exposures via their investments in third party manager's funds, or exchange traded index funds. When investing into another fund manager's fund or into an index fund you can not generally control what investments are held at any point in time, unless of course you have a separate mandate or are following and ethical index. For many mainstream investors with no particular bias or religious beliefs, there has to be a general level of acceptance, that when you invest into another pooled investment vehicle or index fund, there may be some holdings that you do not agree with, or for personal reasons, would prefer the manager did not hold. If investors feel so strongly about following an ethical or socially responsible path, there are options available to them within KiwiSaver. Many of the existing managers who have named and shamed across various publications have announced reviews of their manager selection criteria and investment approaches. We should also keep in mind that many of the investments in some of the companies such as Honeywell International and Northrop Grumman, for example, are as a result of investments into other fund managers who have exposures to these types of companies. Although exposure to some of the companies is not ideal, in order to gain global exposure to a wide range of companies that represent the market, there will be some collateral damage. If as an investor you wanted to take a pragmatic approach and looked at the bigger picture, the actual dollar exposure to undesirable companies is actually microscopic. But for some even a few cents or a couple of dollars is too much. Grosvenor has announced they are switching managers in order to tidy up their portfolios and no doubt to distance themselves from any unwanted attention. New entrant Simplicity is taking a different approach and is in discussions with Vanguard, who provides their international share exposure, to design a product that is suitable for the NZ market (and presumably beyond), that takes into account the ethical and responsible investment approach adopted by the NZ Super Fund. If enough KiwiSaver managers can join together as a united voice and tackle the issue with managers like Vanguard, change is more likely to occur. How do I know where my KiwiSaver fund is invested? Each March, KiwiSaver managers are required to disclose their entire portfolio in an excel file and these will be found on the various websites alongside the quarterly disclosure statements. You can also ring your current manager and ask them directly what holdings they have. For commercial reasons they may not be willing to provide their most up to date information, but should still be able to put your mind at ease that they are not invested into certain types of investments. Top 10 holdings are disclosed every quarter too as part of the KiwiSaver managers' regular reporting requirements. Some managers also release monthly commentary and fund updates, and these can also be useful resources. There are many shades of green when it comes to socially responsible and ethical investing. Even if a fund says it's socially responsible or is included in a socially responsible index, it may still have exposure to some companies that you as an investor may find offensive. Take for example BP. The oil giant is included in the MSCI EAFE ESG etf which invests in securities outside the US and Canada that have positive environmental, social and governance (ESG) characteristics. That's even though BP's Deepwater Horizon oil leak in the Gulf of Mexico remains fresh in the memory. The clean up costs and subsequent settlements were in the tens of billions of US dollars. In another example, the ishares MSCI KLD 400 Social Index includes sportswear giant Nike, a company that in the past has been linked to child labour and sweatshop allegations. Alongside Nike is cosmetic company Estee Lauder. The cosmetics industry has long been associated with animal testing in the process of manufacturing their products. These are just some brief examples of companies that could appear in socially responsible or ethical funds. A recent article by Mark Lister of Craigs Investment Partners further highlights some of the dilemmas investors face when considering ethical or socially responsible investing. His article is here. Another piece worth reading is this from Massey University's Claire Matthews here. Ethical investing is a personal choice first and foremost. If you are concerned about how your manager is investing your funds, don't be afraid to ask your KiwiSaver manager what they are doing to minimise their exposure to certain types of investments. Also check out your current managers Responsible Investment Policy on their website. If you are not satisfied with your manager's response or their investment strategy/investments they hold, then you should seriously consider switching to a fund where the investment strategy is more palatable and in line with your preferences. *Craig Simpson is a shareholder in the management company that runs the Amanah Ethical KiwiSaver Fund. The opinions expressed in this article are his own. what you going to do - put them all through an ethics questionnaire before accepting their money? what about those arms companies with investments in NZ dollars for one reason or another - going to abandon the NZD because of it? would you turn it down? Yes. I do think the story was overhyped. As investors in the markets we make our decisions and it's not correct to portray that we are innocents being misled. If it's important to somebody where their money is placed, then they need to shift themselves and make sure it's where they want it to be. Seems to me most of the people who have placed money in bad places it's because they are not bothered about the issue. One point I didn't make in the story is that as investors we can also be quite hypocritical. We want ethical investments in our portfolios but at the same time we are also quite happy having a couple of beers after work or a wine with friends etc. Why create a NZ Home Build Fund. Like the government did with NZ Post bought by Kiwi Bank using $450m of the NZ Super fund. Use $5n from fund & the Govt could borrow offshore at 0% another $5bn. Encourage kiwi depositors to invest as there's $153bn sitting in the big four ozzie banks in deposits....that'll get houses built and a return for investors. Simple really. Not something this governments good at. Thinking of simple ways to solve simple problems...just do it! Talking about it just increases low productivity as it has done. The issue with this sort of stipulation is that it runs headlong into the old, old Bill of Materials (BOM) explosion problem, which is essentially one of volume. A company in which a fund is invested has three main product lines: cars, buildings and submarines. The cars LOB has 15 models, each with a BOM that runs to 5,000 parts, 10% of which are built-up units with their own BOM's averaging 30 components each. 15 models x (4500 + (500 x 30)) parts = 292,500 investigations. This is an overly simplistic article. Fund managers simply are not in tune with what appropriate investment is. It is clear that people don't want to invest in cluster bomb manufacturers (and from memory it is also illegal to do so) then fund managers should actually get their mandates right. It's not as if you don't know who you are investing in. To suggest some "collateral damage" is simply lazy fund management. The fund managers aren't lazy, far from it. 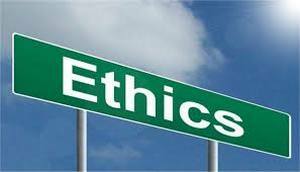 The lines around ethical investing can be blurred as I noted in my article. Take Honeywell that is highlighted in the media. As Fisher Funds in a letter to their investors rightly point out, this is a diversified American company that produces a variety of consumer and commercial products and has a very small portion of its overall income derived from the defense or space sector. Should Honeywell be blacklisted under the nuclear company classification? The fund managers are totally lazy, charging huge fees just to invest in a listed ETF index trackers. If they are going to go supersize on the fees they could at least do a bit of research to pick index trackers that are in compliance with nz law. That's another dirty little secret. The point of passive ETFs is to avoid investment manager fees. With most kiwisavers, you get all the problems of passive index trackers, but without the benefit of low fees. Take the smart kiwi US S&P 500 fund for instance, they charge you 0.35% to 'manage' your fund, and what managing do they do? They invest it all in one stock, the Vanguard VOO ETF. Why not cut out the middle man and invest in VOO directly, then you only pay Vanguards 0.05% fee instead of 0.05% + 0.35%. Socially Responsible index trackers do typically have larger fees as they are a more niche product, but you can still expect to pay less than your typical KiwiSaver managment fees. E.g. Vanguard's VFTSX, 0.25% fees , and invests in the FTSE Social Index which includes only "stocks that have been screened for certain social, human rights, and environmental criteria." Totally agree about cutting out the middle man and especially with your example of the Smart Kiwi US S&P 500 - we used to access an iShare S&P 500 for 9bps for our clients. Some of the additional cost for NZ investors will be incurred due to the onerous compliance regime. From my first hand experience I can tell you that the KiwiSaver regulatory and compliance costs are truly horrendous and I think certain service providers are behaving more like investment bankers around a trough. Keep in mind too if you go direct you may also have to pay brokerage which if using an NZ broker is expensive and there could be a buy/sell spread. But even so still better off than dealing with the local repackaging agents. When the integrity and sanity of the next American President is up in the air, will it matter if KS funds are invested in any American company/exchange ? Moral of the story : Who or what is above board and fully ethical ? Stop hiding behind feeble excuses. Most investors don't expect a 100% ethical guarantee-but they do quite rightly, expect fund managers will adhere to well established best ethical practices. There are many good fund managers the world over that have firm, tested ethical guidelines and systems to follow . In NZ, the principles behind NZ Super Fund are sound - just develop these as your minimum standard. Weak, lazy, and shonky oversight of funds management and a lack of transparency being exposed just doesn't give consumers the rights and choices they deserve. 100% agree, and all the govt needed to do was to say to the providers if you want to be a default provider then you require to ethical to the same standard as the NZ Super Fund. Making money for your customers is not an ethical decision. Its a job. Fund managers exist for only one reason. To provide the best possible return for investors.